The 5Cube is Ireland’s first renewable energy design feature and is a physical representation of how much oil Ireland is consuming every five minutes. The aim of the 5Cube is to get citizens thinking about our dependency on fossil fuels and to consider renewable sources of energy that are cleaner, and ultimately cheaper, alternatives. The 5 Cube was selected as the winning design following the Imagine Energy design competition in 2013 for a smart energy feature in the city centre as part of its involvement in the EU-funded Ace project. 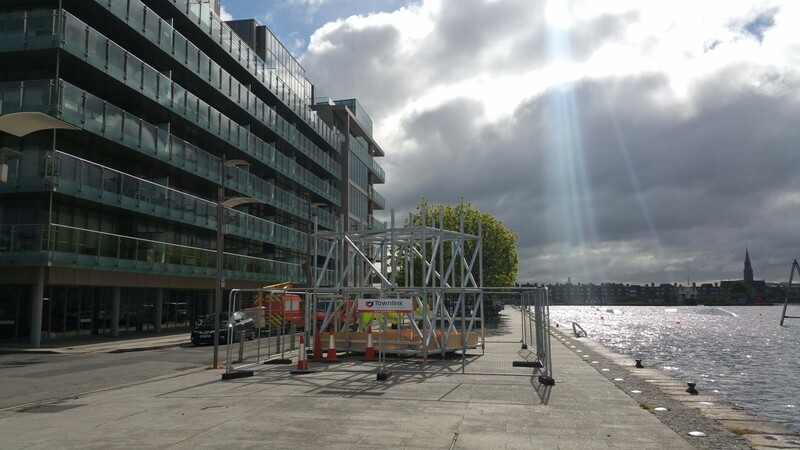 The location for the 5Cube is at Hanover Quay in Dublin’s Docklands. This site was selected as it is right in the heart of Dublin City’s Sustainable Energy Community , an area that is home not only to world leaders in finance and technical innovation but also schools, residential housing and small indigenous businesses. Many resident companies have strong expertise in implementing energy-efficiency schemes in the workplace and can act as leaders for promoting sustainable energy practice. The 5Cube has been constructed with durable, shiny black glass to convey the concept of oil. It will be self-sufficient through solar photovoltaic panels powering the screen and an LED illumination. One side of the cube will feature a 'sky mirror' and on the opposite side a kaleidoscope will give multiple reflections of the sky, forming a globe shape when you look into it. Inscribed on the 5Cube is text saying 'We consume this cube of oil in Ireland every five minutes'. Ireland is 89% dependent on imported fuels for energy and we are currently spending €6.5 billion on fossils fuels each year. Within this, oil is the dominant energy source, with a share of 47% of total primary energy required. In five minutes alone, we are using over 75,000 litres of oil and releasing 210 tonnes of carbon into the atmosphere. The financial cost of this is approximately €57,000 but if we were to look to renewable energy as the most proven solution, we would be able to keep this money within Ireland and help boost the internal economy. From an environmental perspective, we need a striking presence like the 5Cube to develop Dublin as a clean, green and sustainable city. The water table in Dublin is already rising so we can no longer afford to ignore how our energy is generated and how this contributes to global warming. We should look to renewable sources like solar, wind and biomass as cleaner and more cost-efficient way of powering our homes and workplaces. 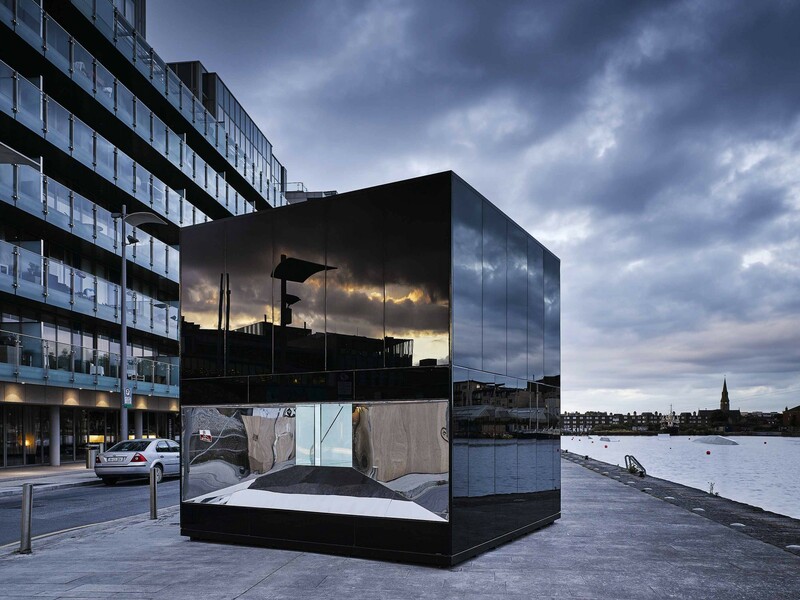 The 5Cube was designed by Declan Scullion of de Siún Scullion Architects. De Siún Scullion Architects are a new Dublin-based practice established in 2014. Both partners, Mícheál de Siún and Declan Scullion, bring a broad range of expertise to their work from their experience with large practices in Ireland and the UK. They have taught at the architecture schools of Queen's University Belfast and Dublin Institute of Technology. The work of the practice is spread across the private, commercial and public sectors and focusses on finding unique sustainable solutions for every client.